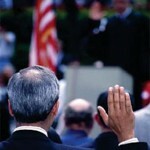 Naturalization – Geno Law Firm Offers the Right Help for your Citizenship! If an individual has obtained permanent residence through marriage to a United States Citizen, the individual may apply for citizenship three years after the date on which his permanent residence was granted. The application may be filed up to 90 days prior to his three year anniversary of obtaining permanent residence. The applicant for citizenship must demonstrate the ability to speak and write English and pass a test on United States government and history. If the interview is successful an oath ceremony is scheduled so the prospective citizen will pledge the Oath of Allegiance and receive a certificate of naturalization. The new citizen is then eligible for the benefits of United States citizens, and to sponsor relatives. Many new citizens file applications to bring their parents to the United States as permanent residents. Spouses of United States citizens assigned abroad may be eligible for expedited naturalization. Citizenship is often felt to be an easy application to file (the application is called an N-400 Petition). However, it is also the application that involves many problematic issues: residence and good moral character are two of the most complex issues that arise in citizenship applications. Many individuals are not eligible for citizenship and, therefore, should not apply. This is often the case for individuals convicted of certain crimes. Filing an application for naturalization can lead to removal proceedings for these individuals. If a permanent resident has ever been arrested, he should consult an immigration attorney prior to filing for naturalization. Permanent residents who have spent significant amounts of time outside of the United States should consult an experienced immigration attorney who knows how to perform citizenship eligibility date calculations prior to filing for citizenship. Applicants who are religious missionaries and those applicants serving in the United States armed forces have special rules for their physical presence and residence. This qualification for citizenship can be an obstacle for those men who have not registered with the Selective Service when they were required by law to do so. Certain applicants may be exempt from these requirements due to age or disability.